I was blog surfing and found this fun linky and thought I should take a break from grading (any excuse to procrastinate) and participate. 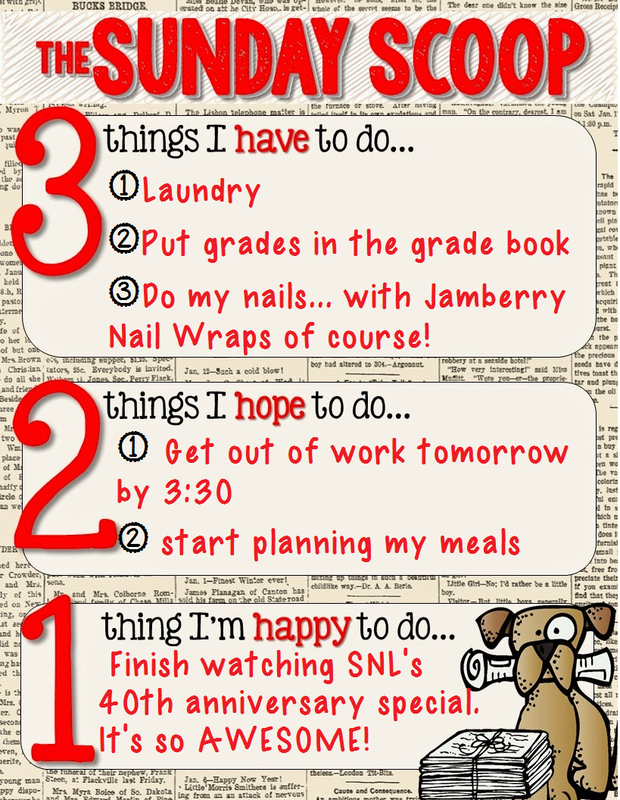 Check out The Sunday Scoop by The Teaching Trio! Just click on the pic to the left to see who else joined the linky. Many of you are off tomorrow because it's President's Day or because you have a snow day. I have to go to work. The students are off but the teachers go in for an inservice. It's 10:00PM here and I am watching Saturday Night Live's 40th Anniversary Special. Perhaps I should get this post finished so I can do all the stuff I HAVE to do before bed tonight. Time to go check out everyone else's Sunday Scoop! Ha ha! I stopped grading to jot my Sunday Scoop post, too! It was certainly time for a break! Sorry you don't have tomorrow off. I forgot about SNL; grew up watching it while I used to babysit! !